The misconception that shared value can only be achieved by large corporations is preventing small to medium enterprises from seizing opportunities in the space, writes Emerald Araiza from the World CSR Congress where she was named a global ethical business leader. Global summits are terrific platforms for sharing ideas and best practices with passionate, like-minded individuals. It is also an opportunity to discuss various solutions to challenges that may be affecting us all equally, wherever we are in the world. I just participated in the World CSR Congress held in Mumbai, India last week, and what I appreciated the most: global reflections. Besides being humbled to be listed as one of the 100 most impactful CSR leaders, I was honoured to chair a panel discussion and to deliver a presentation focused on the Corporate Responsibility Megatrends to 2020. I would love to elaborate on each point, however it would take an entire book to do so. One of my points really struck a chord with the global audience and led to avid discussions, not only during the conference but also while networking with fellow colleagues – shared value. Given that the term was recently coined, there is not much familiarity with the concept of “shared value”, even though many businesses are practicing it. This lack of uniformity may be leading to misinterpretations and causing a lack of support for business case purposes. 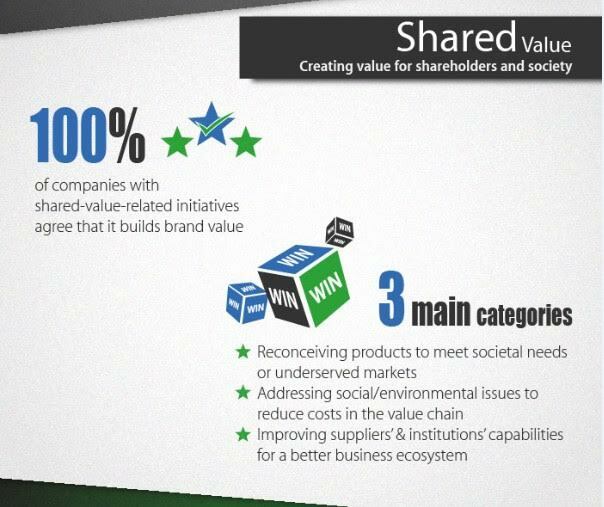 There seems to be a conflict between the concepts corporate social responsibility (CSR) and creating shared value (CSV). Some people refer to them as rivals – either you do CSR or you do CSV, CSV brings better outcomes than CSR, and so on. Some young practitioners are now confused and not sure of what companies are accountable for. Although the benefits of CSV are evident for any kind of business, most success stories feature large multinational companies, and how they have developed new products, reengineered their supply chains or diversified their markets to solve societal issues – while also generating business opportunities. It might be perceived as a model that requires a great amount of investments and massive logistical efforts. It is common to find examples of small and medium enterprises [SMEs] that are benefiting from CSV programs, however, there are only a few examples of SMEs actually developing shared value initiatives. This is leading to the belief that CSV is an exclusive practice for large companies, or that media and advocates choose to promote cases that involve big brands. Neither of these reasons contributes to the advancement of shared value, and to spreading the benefits of this practice. Undoubtedly, there is great need to promote and communicate the features of CSV. It should not be hard to create more spaces in various forums to talk about its value for business, society and the environment, as well as CSV’s challenges and opportunities. Some attendees concluded that the use of standards in the practice should be widely spread, as to have a common ground for global research, studies and benchmarking purposes. However, we should not fall in the trap of misconceptions, or rivalry of concepts. More SMEs that are developing shared value initiatives should be encouraged to share their stories. Advocacy platforms could multiply the CSV phenomenon if SMEs are invited to talk about their best practices in terms of closeness to the community, visibility and agility, but also to discuss about their unique challenges and the way they tackle them – this is part of what I shared with the audience when I spoke about how we do CSV at DS PRIMA. The opportunities to create value for shareholders, the community and the environment are as countless as the chances to learn about and advocate for CSV. A great way to do this is participating in events organised by the Shared Value Initiative and its regional partners like Shared Value Project in Australia and Shared Value Initiative India. You can find out more about the Corporate Responsibility Megatrends here. 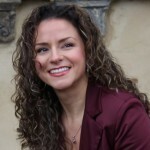 About the author: Emerald Araiza is Head of Corporate Social Responsibility at IT consultancy DS PRIMA where she’s in charge of the shared value program Prime Technology for Our Community. Over the last 10 years she has been responsible for the conception and management of award-winning sustainability programs in global, public and private organisations.